The focus in our program is on temperament and health. All of our breeding dogs have been chosen for their wonderful temperaments. They will only go onto having puppies if they do well on all their extensive health testing. Their beautiful looks are just an added bonus! Health Tests: OFA prelim Hips GOOD, OFA prelim elbows normal, OFA eyes, OFA cardiac, OFA thyroid, full DNA profile including PRA and VWD Clear. Juno lives in a fun Guardian Home in Abbotsford with two playful children! Here is what Juno's guardian mom says about her: Juno is loyal, loves to cuddle and listen to stories when we read to the kids. She loves to fetch and go for hikes and walks. She is so smart and picks up on new training skills quickly. She is soft and such an array of beautiful colours, strangers are constantly stopping to find out more about her and also her breed. She looks great when her hair is long or short and reminds me of a regal type horse the way she gallops, such a pretty sight. She is a happy girl and is very easy to love! Health Tests: OFA Hips Fair, OFA prelim elbows Normal, OFA eyes, Cardiac normal, Thyroid normal, full DNA profile including PRA and VWD Clear. Buttercup is our gorgeous Sunny daughter! She is a very special girl. She is one of the kindest and most loving dogs I have ever met. She is affectionate with everyone she meets. She has never met a stranger and thinks the whole world is her friend. Buttercup has a beautiful fleece coat. She used to be all chocolate but is slowly getting some pretty silver tips along her back. We think she would be gorgeous no matter her colour because her heart is so big. We love our sweet Butters. Buttercup lives with her doting Guardian mom, Sue, and gets lots of love and attention from Sue's children and grandchildren. Health Tests: OFA prelim Hips Good, OFA prelim elbows Normal, OFA eyes, OFA Thyroid, OFA Cardiac, full DNA profile including PRA and VWD Clear. Ruby is our keeper girl from Rosie's last litter of puppies. She is our perfect puppy; the girl we have always dreamed of. She is perfection is every way. She is easy going, gentle, friendly, and super cuddly. She has a beautiful fleece coat with lovely loose waves. We have no doubt Ruby will be an amazing mommy dog just like her momma Rosie. Health Tests: OFA prelim Hips Good, OFA prelim elbows Normal, OFA eyes, Cardiac normal, Thyroid normal, full DNA profile including PRA and VWD Clear. Calli is our tiny, crazy cute little spitfire of kisses and cuddles! She is playful and affectionate. She reminds me a lot of her momma Tomato and grandma Marie. They are all playful and happy girls. Calli lives with two children she adores. She goes camping with them, plays at dog parks, goes to school with her kids, plays at doggy daycare three times a week, and has an all around fun life with her Guardian Family. We are excited for little Calli to have her first litter of little miniature cuties sometime next year. Health Tests: PennHIP 0.36 and 0.35, OFA prelim hips GOOD, OFA prelim elbows normal, OFA eyes, full DNA profile including PRA and VWD Clear, OFA Thyroid, OFA Cardiac, OFA Patellas. Alakazam is a gentle, friendly little guy. He doesn't have a mean bone in his body. He plays gently, cuddles gently, and even gives the softest little puppy kisses gently. He is a lovely boy and should produce lovely little miniature and medium puppies for us depending on who he is bred to. We are excited for the possibilities with this little love. Alakazam will be a daddy to both caramel and chocolate adorable cuties. Watch for Alakazam's upcoming honeymoons! Alakazam lives with his Guardian Family only 15 minutes from us. He gets to go to work with his guardian mom everyday! Health Tests: PennHIP 0.45 and .44, OFA prelim Hips GOOD, OFA prelim elbows Normal, OFA eyes, OFA thyroid, OFA cardiac, full DNA profile including PRA and VWD Clear. Oliver lives in a wonderful Guardian Home! Here is how his guardian mom describes him: Oliver is loving, cuddly and funny. He is always ready for a good belly rub and he loves giving kisses. He wants to please and is very loyal. He loves kids the most and playing with other dogs. 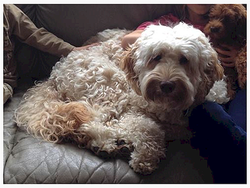 Oliver came to us from our friends at Leapfrog Labradoodles! Thank you Cheyene for co-owning this spectacular boy with us! Health Tests: testing underway! Will update as they are completed. Tug is a gentle, affectionate, sweetheart of a dog! His guardian family named him tug because he tugs at your heartstrings. He is in tune to his people and loves everyone. He is an easy going, relaxed boy. Tug has a beautiful easy care fleece coat. We are hopeful he will pass on his lower maintenance coat to some of his puppies! 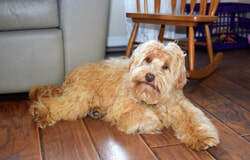 Tug lives in a Guardian Home in Abbotsford with our friends Dana and Roxanne and their adorable mini Australian Labradoodle friend, Esme. Sunny is the sweetest dog ever! She is gentle and loving. She has a sweet and mellow temperament. Her favourite thing is to cuddle up next to a person and get pets. She plays well with our other dogs but as soon as she is called races up to the person and sits down for a snuggle. She will always choose cuddles over playing. Sunny produces lovely puppies with super sweet and affectionate temperaments just like hers. Sunny lives in a Guardian Home where she gets non-stop love and attention. Sunny is now retired. She will live forever with her adoring guardian family. Little Marie is my soul mate doggy. She follows me everywhere and is always waiting for a smile or a cuddle. She zips around playing but also melts in your arms for cuddles. She does the cutest little paw scratch when she wants pets. It's hard not to pet her whenever she asks! Marie has a beautiful wavy fleece coat that does not need much brushing. Marie lives with us in our home. She sleeps next to me and walks to school with us everyday. Marie has retired from her breeding career. She is now our wonderful puppy socializer and teacher! Rosie is our happy, happy girl! She is super friendly and outgoing. She will jump into anyone's lap for a cuddle and then bounce off to play with a toy or another dog. Rosie loves to go for walks and meet as many people as she can. She also loves to have playdates with her doggy friends. We should have named her Little Miss Socialite! Rosie grew into a beautiful medium sized girl. She has a solid lab like build but in a nice smaller medium size. She has smaller dogs in her pedigree so we are expecting she will produce both medium and miniature puppies. We are very excited for Rosie to be a mommy dog because we know her puppies will be outgoing, friendly sweethearts just like she is! Rosie lives in a Guardian Home with two adorable little boys, Henry and Sebastian. Health Tests: OFA prelim hips GOOD, OFA prelim elbows Normal, OFA eyes, full DNA profile including PRA and VWD Clear, OFA Cardiac, OFA Patellas, OFA Thyroid. Tomato is an adorable little daughter of our Marie! Tomato is turning into a beautiful parchment colour like her momma Marie. She has a soft fleece coat and a fun, athletic temperament. She is affectionate and friendly and very playful. She loves to give kisses in warp speed and will try her hardest to jump right into your face to give them to you! Tomato is full of life. She is a big dog in a small package. We are very excited for Tomato to have her own baby Tomatoes one day! Tomato lives with her own wonderful Guardian Family where she gets a ton of love and attention.